When I was but a wee lad in the late 1960s, I was besotted with... umm, something. I didn't have the faintest idea what it was, but I could instantly recognise the weird sounds that I loved pervading the music that my parents hated: Traffic's 'Hole In My Shoe', Pink Floyd's 'See Emily Play', The Move's 'Blackberry Way'. Ken Freeman in 2005 with Prototype #4, the last and greatest of the string synthesizers he designed. What they didn't realise (and, to be honest, neither did I) was that I was listening to recordings of three little old ladies playing their violins in someone's bedroom in 1952. Of course, what we thought we were hearing — I with delight, they in disgust — were sounds generated by one of those new-fangled synthesizer thingies. But as the years passed and psychedelic rock metamorphosed into prog-rock, it soon became clear that the notes were emanating from a huge brown organ called a Mellotron. Or, sometimes, it was a funny little white organ called a Mellotron. But either way, the sound was always haunting, and a generation of spotty, post-pubescent males spent every possible moment in the company of the Mellotron-flourishing 'progressive' bands of the era. 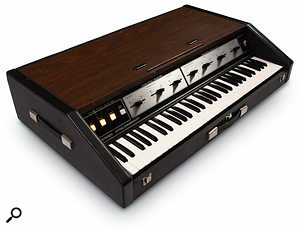 Inevitably, those of us who played keyboards and dreamed of stardom tried to recreate the sounds of our heroes, replacing our heroes' (expensive) Minimoogs with (cheap) Japanese monosynths, their (expensive) Hammond organs with (cheap) Italian organs, their (expensive) RMIs with (cheap) Italian pianos, and their (expensive) Mellotrons with... Well, what could replace the wonderful string sounds of a Mellotron? Fortunately, there was an answer. By the mid '70s, keyboard players could emulate the sounds of orchestral strings without needing little old ladies or big, butch roadies. Sure, the sounds were not in the same league as those of a Mellotron, but bands as diverse as Camel, Caravan, ELO, Gentle Giant and Renaissance were soon plying their trade with much smaller, lighter and more reliable instruments called String Ensembles, or String Synthesizers. 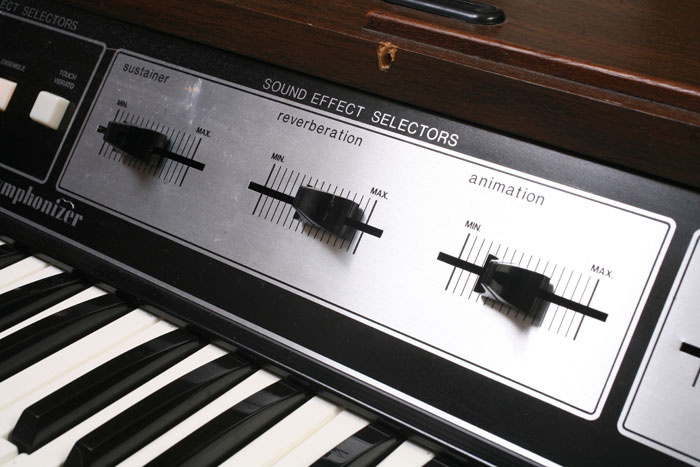 Almost as influential as the Mellotron itself, they quickly became as important to players as pianos and organs. Even today, no sample library can be deemed complete without a selection of 'string synths', and for two decades polysynths have been judged, at least in part, by the quality of their string ensemble sounds. Although it sounded wonderful, and had finally realised the dream of a polyphonic keyboard that sounded (somewhat) like genuine strings, an early Mellotron cost more than a house and needed four people to move it. As a consequence, you were unlikely to get your hands on one of those for Saturday night's gig down the pub. If you were one of The Beatles, you had one. But if you were Gordon Reid (aged six and a quarter) or Ken Freeman (aged 20), there was no chance. The Selmer Clavioline wasn't intended as a string synth, but Ken Freeman found that playing it through a Copicat delay opened up new possibilities.Photo: Gordon ReidIn 1966, Freeman was the keyboard player in a band called the Unsquare Men, a name they obtained from their signature tune, Dave Brubeck's 'Unsquare Dance'. After they changed their name to Second City Sound and later won Opportunity Knocks for six weeks running, they found themselves performing regularly, playing the Top 10 every week in venues across England. This wouldn't have been a problem for Freeman, had it not been for the fact that many of the songs included string arrangements. No doubt he could have reproduced these using a Mellotron, but this wasn't practical from either a financial or a logistical point of view. What Freeman had, however, was a Clavioline. The Clavioline had been around since 1947, and was itself the successor to the earlier Hammond Solovox. Both produced a range of imitative, monophonic sounds by allowing the player to select predetermined settings of their low-pass filters, their high-pass filters, attack settings, vibrato rate and depth. They even offered knee levers that allowed the performer to control the volume of the sound in real time. Used as preset synthesizers, these instruments and their spin-offs produced very distinctive timbres that became mainstays of the '60s palette of novelty sounds: witness the Beatles' use in 'Baby You're A Rich Man', Del Shannon's 'Runaway' and, of course, 'Telstar' by The Tornados. But they sounded nothing like strings — until Ken Freeman got his hands on one. "I was trying to imitate string sounds, and I started experimenting with the Clavioline," he explains. "Played from its keyboard alone it sounded no better than a Stylophone, with no attack to the sound or delay on the vibrato. I could make it sound better if I used the knee control to swell the sound, but that was about it. Then I discovered that if I played it through a three-head WEM Copicat, the vibrato came back out of phase, and if I held a note down, I got a chorused sound that mimicked the way that the vibrato of each player in an ensemble is out of phase with all the other players. Having discovered this, I found that, if I played slowly, I got this amazingly effective sound that soared above anything else. "Next, I tried to create chords, and discovered that if I arpeggiated my fingers in time with the echo I could get a chord. The knee control remained a big part of the technique, because I needed this to create any form of expression. But as for the invention of string synthesizers, that's all there was to it. I realised that if I could play polyphonically and every note had different articulation and modulation, I could mimic a string section. So I decided to build an organ with three sound generators, each modulated by a different vibrato oscillator, and that's how the string machine was invented." Nonetheless, there were huge steps to be taken before Freeman's discovery could be translated into the dream of a polyphonic keyboard with shaped notes and a 'string ensemble' sound. But Freeman wanted this sound and was determined to obtain it — not for commercial gain, but because he wanted to imitate string sections when he was performing. Ken Freeman's ideas eventually reached the market in the Freeman String Symphonizer. Photo: Gordon ReidKen Freeman had left school without any formal music or electronics training so, having discovered the ensemble effect, he set about teaching himself electronics out of the magazine Practical Electronics. This showed him how to build simple circuits, and he quickly learned how things such as transistors worked. "Since they wouldn't give me the diagrams, I asked them whether I could buy the insides of an organ so that I could experiment with it, and I was amazed when they said 'yes'. I don't remember how much they charged me, but it couldn't have been much. No wonder. What I received wasn't a modern printed circuit board, but a brown Bakelite board with holes drilled in it. Components were just rammed through the holes and their legs were twisted together without solder! It was terrible. There was a master oscillator — a coil — and the board had all the dividers on it, twisted together in this fashion. I was horrified. It worked, but it was so old-fashioned! Nevertheless, it helped me to gain the knowledge I needed to build my own sound generator and, in 1969, that became the basis of the original String Synthesizer. "There were 12 oscillators in Prototype #1, and you had to tune each one individually. The machine had a wooden top, and I mounted the oscillators underneath this so that there were 12 tuning screws sticking out of it. I then wired up 12 vibrato oscillators that I made by placing a capacitor across 12 low-frequency square-wave oscillators. I now had an organ where the pitch of each note went up and down, but with a different depth and speed, and each modulation was out of phase with every other note in the octave. This sounded different from organs that had just one vibrato oscillator, but it still didn't give me a full ensemble effect, so when I recorded with this instrument, I double-tracked it. This sounded really good because, when you play, you play differently each time, and the prototype would drift in and out of tune slightly, and all the notes were slightly different anyway." "You still can't use a keyboard to get the sound of violins — and especially the sound of a small string section — to my liking. This is because you're playing one sound, and you need a different sound for each note, as well as the means to play it differently. After all, different violins don't sound the same, and even one violin doesn't sound the same when played by different players. None of this has been addressed in synthesis. Maybe physical modelling is the way to go. I like the idea of generating a list of frequency versus amplitude snapshots, a matrix if you like, and using a computer to interpolate between these harmonic maps. If you could do that, you could also randomise the output a little to create subtle differences. Then it would be the human interface that would be the limitation, because it's hard to control a keyboard like a violinist controls a violin. Maybe it could be done with pedals as well as keys to change harmonic structures, introduce bowing noise, and so on. You could then extend these principles to other instruments. Even today there's lots of room for improvement in string synthesis." 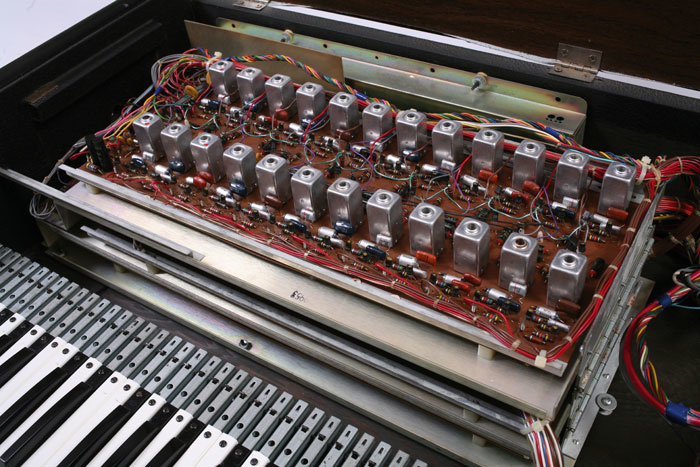 Apocrypha has it that Freeman built his earliest string synthesizers in 1966, but that's not correct, and the most famous was the second prototype, which appeared in 1970 after a further year's experimentation supported by City Electronics, an organ shop in Harrow. Freeman built this to interest possible investors and partners. It still used the 'divide-down' technology he had adopted from the guts of the unnamed organ, but each note was derived from no fewer than three master oscillators that could be detuned against one another, and three sets of dividers, all built from discrete components mounted on veroboard. There were now three modulation oscillators (one for each master oscillator) and the pitches of these could also be detuned relative to one another so, in retrospect, it's no surprise that this keyboard had a lush ensemble sound that has passed into synthesizer folklore, although Freeman himself feels that the original version, double-tracked, created a better sound. Among the innovations that Ken Freeman introduced in his string synthesizers was the use of an Ensemble effect.Photo: Gordon ReidExhibited in 1971 by City Electronics at the 'Musical Instruments Fair' at the Russell Hotel, London, Prototype #2 attracted the interest of a company named Ling Dynamics, which was (and still is) based in Royston, Hertfordshire, and they funded the development of a third prototype. Freeman had hoped that, as a 'real' electronics company, Ling would show him how to design the instrument to commercial standards, but for six months he found himself stuck in a room in Royston with a bunch of components but very little electronics assistance. Nevertheless, he persevered, and in February 1972 he and Ling took Prototype #3 to the Frankfurt Musik Messe. From an engineering viewpoint, this was a much simpler and more basic design than the previous model. Most significantly, it had just two banks of oscillators; one that passed down its signal path without any modulation, and a second that underwent pitch modulation with respect to the first. To quote Freeman, "Looking back, I don't know why I did it like that. It was to keep costs down, I suppose, but it was a false economy. I guess that the powers that be couldn't hear the difference!" Despite its shortcomings, Prototype #3 was a slicker design than before, with a motherboard into which its voice cards slotted. Freeman told me, "We were worried about industrial espionage, so we took the voice boards out of the keyboard each evening at the end of the show. We also stuck a bit of tape on it so that we could tell if anyone had messed with it overnight. One day we arrived and it was obvious that somebody had been poking around. Suspicion fell on a tall guy who had been hanging around the stand the previous day, but it's only speculation whether he was the person who had tampered with it." Almost bankrupt, and unable to put the keyboard into production himself, Freeman ended up as a keyboard service engineer playing occasional sessions. Nevertheless, he continued to try to get the String Synthesizer manufactured, and started talking to the organ manufacturer Lowrey. This should have been a turning point because, as a division of the Chicago Musical Instrument Corporation, Lowrey were probably the largest supplier of electronic organs worldwide throughout the '60s and '70s. But by this point, Freeman was disillusioned with the whole affair. He had spent three years nurturing the String Synthesizer, and it appeared that he had got nowhere. The relationship with Lowrey seemed to confirm this: Freeman wanted to talk about music, they wanted to talk about finances and rights. Nevertheless, an agreement was reached, the head of Lowrey took Prototype #3 to the USA (and still owns it, Freeman believes) and CMI started to manufacture a variation of it. This, for reasons possibly lost in the mists of time, was renamed the Cordovox Model CSS Freeman String Symphonizer. 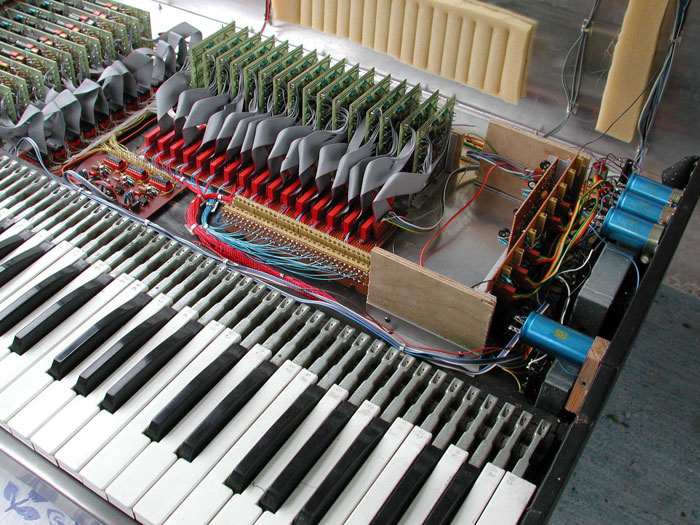 The String Symphonizer was a heavy beast, full of metal frames and electronics. Yet, like Prototype #3, it was a cut-down version of Freeman's vision, with just two master oscillators. The first oscillator was divided down to High and Low settings an octave apart, equivalent to 4' and 8' in conventional terms. This signal was not modulated unless you either (a) increased the Animation — the third slider in the Sound Effect Selector panel — in which case a progressively deeper 4.5Hz vibrato was applied, or (b) activated the Touch Vibrato button, which applied a delayed vibrato (with a ramp lasting about a second) at the same rate. There was nothing stopping you using both simultaneously if you wanted to create an even deeper effect. With only two master oscillators, the String Symphonizer was a cut-down design compared with Ken Freeman's Prototypes #2 and #4.Photo: Gordon ReidThe waveform generated by the String Symphonizer was an unusual shape rich in harmonics, so it had a richer sound than the cheesy 'combo' organs of the period. But it was only when you engaged the Ensemble button that the instrument showed any life. This introduced the second oscillator bank — which was modulated slightly at around 2Hz — at the same octave (or octaves) as the first. If you added this without applying Animation or Vibrato to oscillator bank #1, the resulting sound demonstrated a gentle chorusing effect: not lush, but pleasant. If you then added Animation and/or Vibrato, the relationship between the two oscillator banks became more complex, and a richer ensemble sound was generated. There were two further controls in the Sound Effect Selector panel. The Sustainer was, as was common in those days, a Release control, while Reverberation brought the internal spring reverb into play. The remaining controls appeared in the Volume and Tone Selector panel to the right of the instrument, and these comprised Treble and Bass EQ, Keyboard Balance and Master Volume. The tone controls were aggressive, with the treble slider capable of attenuating fiercely above 1kHz, and the bass cutting much of the sound below 400Hz or thereabouts. This made it possible to tailor the sound considerably. The final facility was an expression pedal input on the rear panel and, as well controlling the volume, this allowed you to shift the pitch of the whole instrument by a semitone to create slurs. On being presented with a Freeman String Symphonizer for the first time, it's possible that players wondered what all the fuss was about. It had a buzzy tone that went 'yaayaayaayaayaayaa...' and sounded not at all like the lush ensemble that they might have expected. However, I've watched players approach the instrument and, even before playing a note, boost the treble and bass into the equivalent of a smiley-face graphic EQ curve. Accentuating the high and low frequencies in this way was possibly the worst thing that they could have done. Much of the perceived richness and warmth of the mid- to late- '70s string machines was a consequence of the limited bandwidth of the delay lines used to modulate the waveform, which meant that their high frequencies were suppressed, not accentuated. Consequently, even when played with a flat EQ, the String Symphonizer had a 'cut' and edge that proved superb for solo sounds (it excelled at soaring melody lines) but was quite unsuited to chordal work. So players obtained much more pleasing ensemble sound from the String Symphonizer by cutting the treble, not boosting it. Ken Freeman (left) at work on Jeff Wayne's War Of The Worlds, with Wayne (right) and session guitarist Chris Spedding.For ensemble playing, one way to use a String Symphonizer was to apply the Ensemble effect with the Animation somewhere around halfway up its scale, with the treble and bass reduced aggressively, just a tad of Sustain applied, and reverb added to taste. If then played with wide, open chords, the results could be magic. Some people also played it through a Leslie cabinet, which added yet more swirl and interest to the sound. But with a whole bank of oscillators missing, it could never match the sound or depth of Prototype #2. Nevertheless, it found favour with some important artists and bands, including Jan Hammer, Pete Sinfield, Dave Sinclair of Caravan, and Italian prog-rockers PFM. It would probably have been a huge success had it not been for two things: the Eminent Solina and the Crumar Stringman. By the end of 1973, Lowrey had been beaten to the market by not one, but two European manufacturers whose string synths generated sounds that were considered to be warmer and more lush than the String Symphonizer's. Far from taking the world by storm, Freeman's instrument became an also-ran in the market that it could have single-handedly created and dominated. 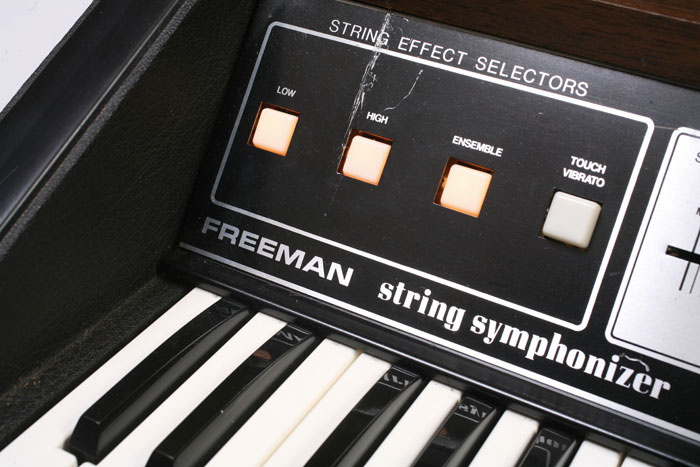 After signing over the rights, Freeman had little to do with the String Symphonizer, received little financial reward for inventing it, and little credit for being the father of the string machine. But I found him to be philosophical about it. Part of his agreement with Ling and Lowrey was that he should be allowed to keep Prototype #2, and this proved to be an astute decision. His understanding of the instrument was far in advance of the block chord techniques employed by most owners of string synths and, as a result, he and his unique keyboard became much in demand for sessions. The most famous of these include David Essex's 'Gonna Make You A Star', Justin Hayward's Songwriter album and, most notably, Jeff Wayne's War Of The Worlds. But these were the tip of the iceberg, with Prototype #2 also featuring on recordings by Roger Daltrey, the New Seekers, Dollar, Jonathan King, Simon May and dozens of others. It could even be heard on numerous entries for the Eurovision Song Contest — sessions which Freeman admits that he hated — and on Freeman's curious and long-forgotten LP, The Electronic Philharmonic, which featured covers of Beatles tracks and others such as Norman Greenbaum's 'Spirit In The Sky'. It was after recording War Of The Worlds in 1976 and '77 that Freeman began work on what would prove to be his final String Synthesizer. Sadly, he cannibalised Prototype #2 to develop Prototype #4, so one of the most famous keyboards in history no longer exists. 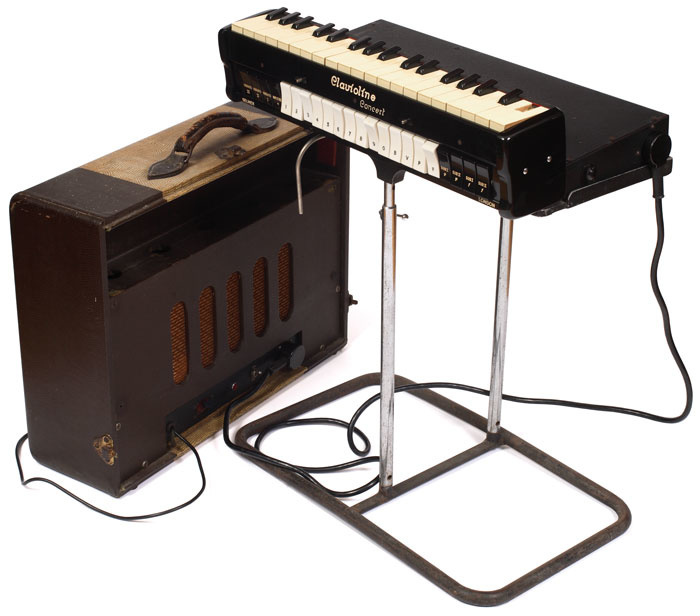 Prototype #4 was fully polyphonic, with three master oscillators and some sophisticated innovations including the use of digital delay lines for vibrato.Photo: Gordon ReidThe fourth prototype was lighter and more transportable than the String Symphonizer, but incorporated many improvements. Most importantly, it eschewed the cut-down architecture and reverted to three master oscillators, but there were now front-panel controls that allowed the player to determine the amount of detuning between them — even before vibrato was applied. Vibrato was generated not by modulating the frequencies of the master oscillators, but by feeding the three channels into digital delay lines driven by independent, modulated clock oscillators, again controlled using knobs on the front panel. Further controls allowed the player to scale the volume of each of the three signal channels across the keyboard, thus accentuating higher or lower notes. But best of all, it was fully polyphonic, and each key had an independent envelope, with front-panel controls for both the Attack and the Release times. Prototype #4 took Freeman a year to develop, much of which was done while War Of The Worlds was being mixed. Once complete, it became his session string synth, appearing on a Who's Who of late '70s albums, including releases from artists such as Mike Oldfield, Sally Oldfield and Jon Anderson of Yes. 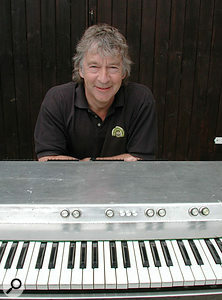 Happily for Freeman, his work with Jeff Wayne had been rewarding financially as well as artistically, and in 1977 he bought a Yamaha CS80 that he modified to produce an out-of-phase 16-oscillator unison, and which he used for solo lines while Prototype #4 produced chordal, ensemble sounds. But time was running out for the String Synthesizers. Freeman had turned his attention to computers, designing a D-A interface for the Commodore PET and starting to write music programs for early personal computers. Although none of his experiments appeared in commercial form, they were used on a number of recordings, most notably Hand Played By Robots, a library album that Freeman recorded with film and TV composer George Fenton. 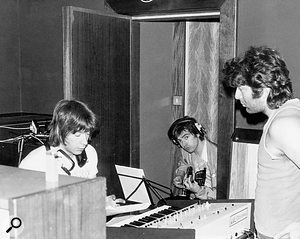 In January 1980, Freeman signed a contract with Jeff Wayne Music to write music for television advertisements, including an award-winning commercial for BMW. Then, in 1984, he was commissioned to write the soundtrack for the BBC TV series The Tripods. A Synclavier bought in May 1980 now sat alongside his CS80 and its purchase had signalled the end for Prototype #4 and the Freeman String Synthesizers. It was the end of an era. Nowadays, Ken Freeman is perhaps best known as the composer of the themes for the BBC TV dramas Casualty and Holby City, and few are aware that he is one of the pioneers of the modern synthesizer industry. But look at his record. He was the developer of the world's first string synth, and perhaps the first to incorporate (albeit basic) digital effects in a synthesizer. It's also likely that his trip to Frankfurt in 1972 influenced other manufacturers' entries into the 'pro' keyboard market, and possible that — after his seemingly abortive trip to Italy — he was the inspiration for the flood of Italian string synths that would appear just a few months later. But, as is so often the case, the pioneer was the person who made the least money out of his invention. This is unjust. Over the next decade, approximately 150 string synths were to appear, and had Freeman or his partners been a little more circumspect about his ideas, or had they patented the key aspects of his invention, they might have become extremely wealthy. Fortunately, Freeman's session work and success in the TV arena compensated, at least in part, for that. Today, you'll find Freeman gigging around the south of England with his band Orion, playing the music from their Seven Sisters album, which is based on the myth of Orion the Hunter. But he's still writing music for TV and developing new technologies, including novel MIDI controllers and an innovative way of using MIDI to compose and arrange synthesized recreations of string sections and small orchestras. Indeed, when I interviewed him in 2005, I found him to be a little bemused by the resurgence of interest in the String Symphonizer. Setting up my Cordovox model alongside Prototype #4 demonstrated that the commercial version isn't a patch on his instrument, sounding thinner, less involving, and less articulate all at once. So I'll leave the last words to Freeman himself. I asked him how he felt about what had happened to his invention. His reply was very brief. "It's sad, really," he said.